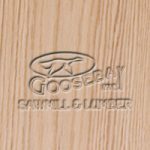 Oak, Red - Goosebay Sawmill and Lumber, Inc.
Red Oak lumber can come from a variety of species, principally including northern red, scarlet, pin, Nuttall, black, southern red, cherrybark, water, laurel, and willow. The species is widely distributed across the United States, but is concentrated and harvested from the Eastern States. The principal species that we sell is quercus rubrum which has a relative hardness of 1290. The heartwood of the red oak is reddish brown, sometimes appearing “pinkish.” Sawn lumber of the various red oak species are not easily distinguished. Red oak is distinguished from white oak by its pore structure. Red oak has open pores making it unsuitable for unlined cooperage and boat building. Red oak is a heavy wood. Although old growth oak tends to have a finer grain, the majority of lumber available is sawn from second growth trees. This wood is generally harder and tougher than the old-growth with a somewhat coarse grain.